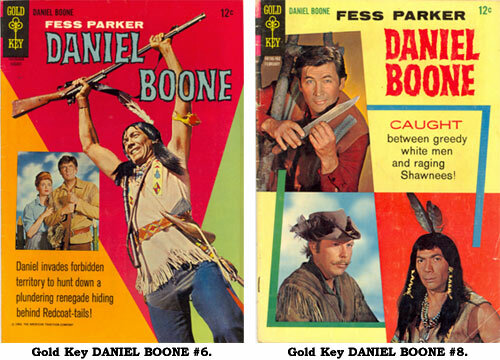 Gold Key’s comic book adaptation of Fess Parker’s hit series about Kentucky frontiersman Daniel Boone began only a few months after the TV series debuted on NBC in September ‘64. 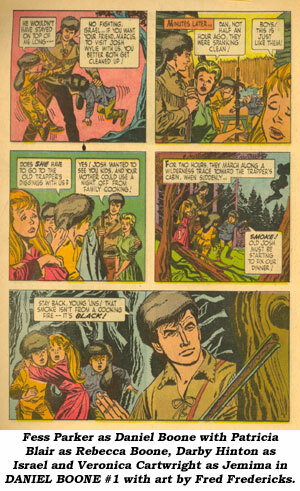 DANIEL BOONE #1 was dated December ‘64 and probably was on newsstands by late October or early November. Gold Key published 15 issues on a quarterly basis (4 issues per year) through #12 (Feb. ‘68). Oddly, there was a lapse of 8 months before #13 came out in October ‘68 then remained quarterly through the final issue, #15, in April ‘69, ending about a year before the TV series did. Every issue included Fess Parker’s name above the title on the cover and every issue had a photo cover of Fess. 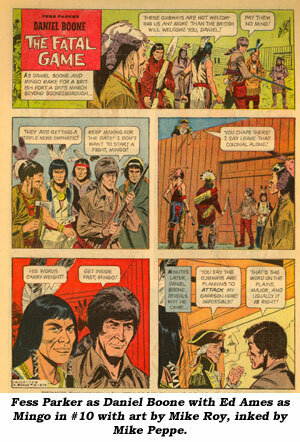 Ed Ames as Boone’s Indian friend Mingo was also on the covers of #1, 2, 4, 5, 6, 8, 10, 11. Character actor Albert Salmi portrayed Daniel’s friend Yadkin in the first two seasons of the series (‘64-April ‘66) and turned up with Fess on the covers of #3, 7, 8, 9—clear into 1967, long after he’d left the series. Patricia Blair (Rebecca Boone) was only seen on the cover of #6 while Darby Hinton as Israel Boone was featured on #14 along with an unidentified youngster. Darby Hinton told WC he doesn’t recall who the boy was, but it is definitely not Fess’ real son. There were back cover photos of various cast members on #1-8. 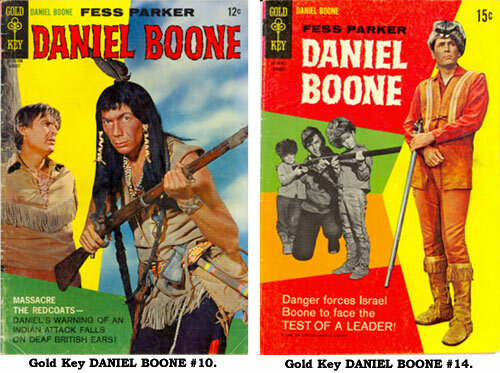 The comic book stories naturally revolved around Daniel Boone, with Mingo and Yadkin alongside him in #1-5. Yad disappeared after #5. Otherwise, depending on the story, Israel, daughter Jemima (played on TV by Veronica Cartwright) Rebecca and even Cincinatus (Dallas McKennon) in #6, 7, and Jericho Jones (Robert Coogan) in #8, 9 were included. Toward the end of the comic book run (#12-15) the stories became less action oriented and more family driven with the tales revolving more around Israel. Some of the TV characters such as Josh Clements (Jimmy Dean), Gideon (Don Pedro Colley), Gabe (Rosie Greer) and Ben Crowley (Warren Vanders) were never mentioned in the comics. The art in #1-3 is by “Mandrake the Magician” comic strip artist Fred Fredericks (1929- ). Fredericks also wrote the stories in #1-3. After that, the scriptwriter seems to be Paul Newman who worked on dozens of westerns at Dell and Gold Key. Mike Roy (1921-1996) on pencils with Mike Peppe inking was the artwork team on BOONE #4-15. Some internet sources allege George Tuska contributed a few panels in #3 but I find this highly unlikely. Dan Spiegle contributed a story here and there. Unfortunately, neither Fredericks nor Roy/Peppe made much attempt to replicate the features of Parker, Ed Ames, Darby Hinton or other members of the TV cast. 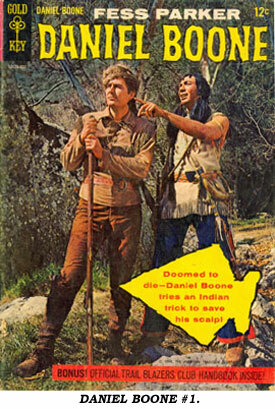 There was also one issue of Western Publishing’s giveaway MARCH OF COMICS (#306) that featured Fess Parker’s Daniel Boone. 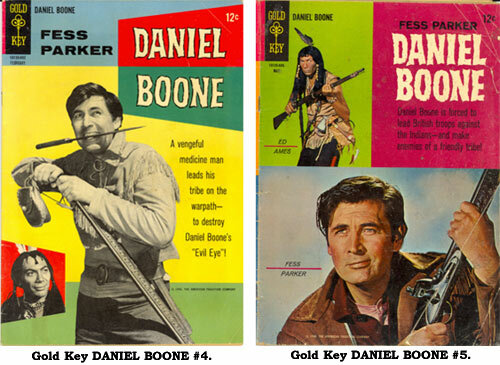 Gold Key’s DANIEL BOONE #1 in Fine usually brings $24 while other issues sell for $9-$15 each.